I bought Gel Caps #3 by NOW to make a supplement for my chihuahua. They worked well and are a great size for her to take. A hard to find item to keep my Cat up and going. This size Gel Caps by NOW is perfect for a little throat. Great price and quick delivery will keep me coming back for more! 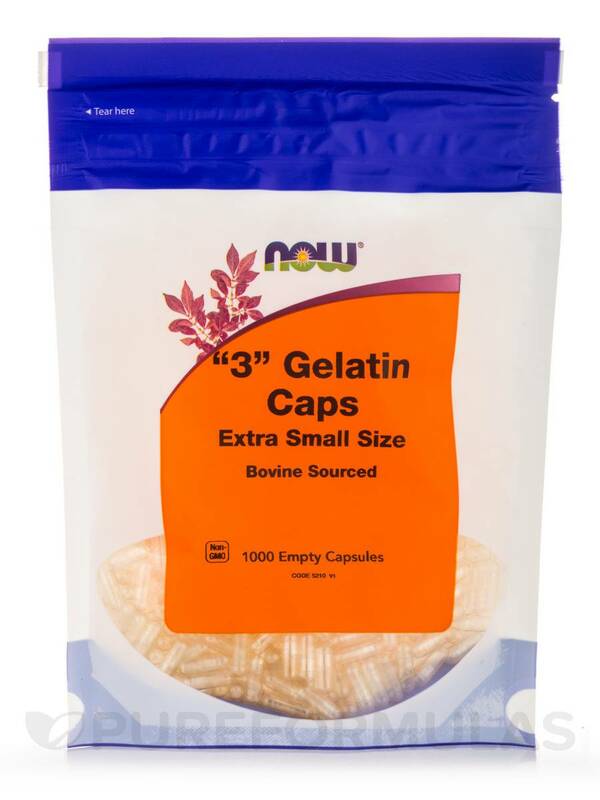 Gel Caps Capsules from Now® Foods is a product made up of small‚ empty capsules. These capsules could enable you to easily fill powdered vitamins and minerals‚ at personalized‚ specific amounts. Empty gelatin capsules present in this supplement from Now® Foods may make it easier for you to take your medicines or supplements. 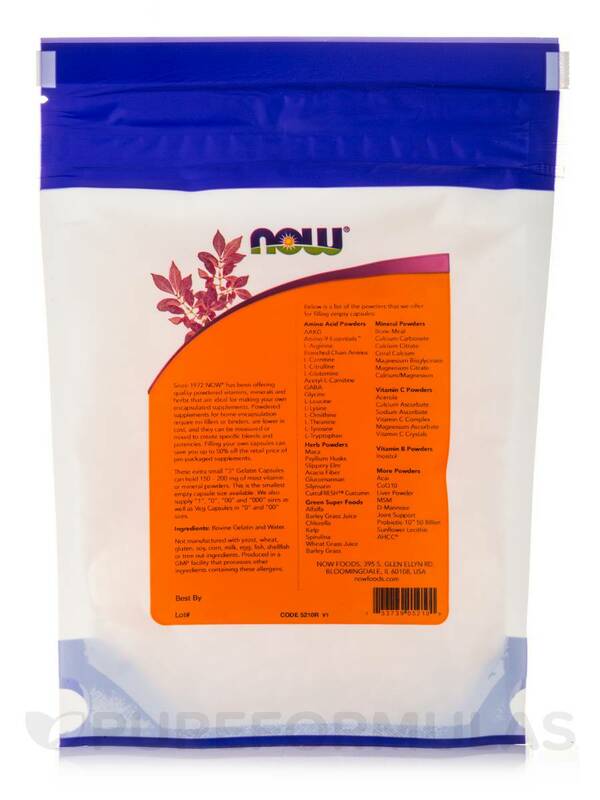 These capsules could help you prepare powders‚ for your specific needs. The small size of the capsules might appeal to those individuals who are uncomfortable taking large pills. Children would also find them easier to swallow‚ thereby ensuring better compliance. The advantage of filling these capsules with powdered ingredients could be that binders and fillers might not be required. Another benefit you may notice is that by filling your own capsules‚ you could pay less. 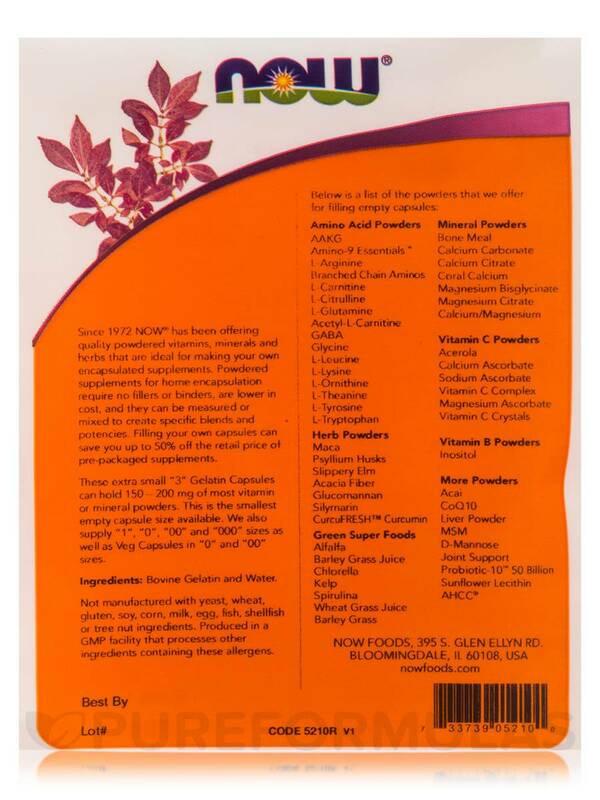 The capsules may be filled with amino acids‚ minerals‚ herbs or vitamins to boost your well-being. Use Gel Caps Capsules from Now® Foods to take your medication in an easier manner. '3' Gel Caps by NOW works best for those small halved and quartered pills, that sometimes crumble when cut. The capsules go down quickly and always followed by drips of water froym a syringe. Extremely important precaution to give water to prevent pill from dissolving in the esophagus. It won't load itself, I get to that. Gel Caps #3 by NOW is a great product for the price. Perfect for those who hate big pills. I was trying to find the smallest size of gel caps for my son to take his essential oils, and Gel Caps #3 by NOW are perfect! They hold the right amount that I need and he's been easily swallowing these for the past week. I'm so thankful I was able to locate these. Small size is easy to swallow. Small size is a little harder to fill but no real problems. I'm looking for a 1000 ct. package of Gel Caps #3 that I can fill with an oil supplement that will not dissolve until consumed. Do you have such a product? Hey Jack, thank you for choosing Pureformulas.com. We do apologize but unfortunately we do not carry empty gel caps that can be filled. Once again we truly do apologize. Have a happy and healthy day!